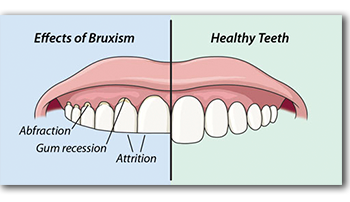 Bruxism/grinding is the common occurrence of involuntary clenching and grinding of teeth most people are unaware they do, – primarily while sleeping. Bruxism may cause headaches, damage to teeth and fillings, and neck pain. Although bruxism may be mild in most cases and not require treatment, if left undiagnosed, painful and costly complications can occur over time. There is an array of various kinds of bite appliances that can be used to treat bruxism. Our office will determine which is best for you. Our approach to treating grinding and bruxing problems is effective and conservative! Come in for a free consultation.